I was out to a client's place last week where I had to wait for the client's representative at their office reception. The wait was a little long (40 mins) because the person I was supposed to meet was in an urgent conference call with his clients. All this while I was seated on a comfortable couch placed at the reception. Seated comfortably, I had just one view in front of my eyes - a decent looking receptionist. Throughout my wait there I could see her busy on the phone constantly. Sometime over the land-phone and sometime over the mobile. Bottom line was she did not stop for a minute. This was enough to trigger this blog post. I started wondering that what can be the best engagement for a receptionist? Data-entry? Paper filing? Mail management? People at the reception are generally low paid staff who are not much educated or have much skills to do any specialised job. This leaves them with an easy option of being over the phone during their complete stay at office everyday. There you find an answer: people who have so much to talk can be creative too and can write as well. 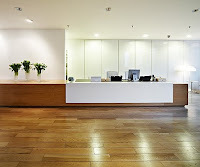 Think if receptionists become active bloggers.. not a bad idea!! Especially with a boom in blogging segment in big companies where companies have started blog forums for their internal communications. Now if the receptionist becomes an active blogger the company can spare one man-power... isnt it a cost saving activity which not only does save cost but also makes use of idle resource...!! This will create a enthusiasm in the mind of the person at the reception which will help in giving a warm welcome to every person to your office...!! So why wait... think and act... may be you have a more active and intellect receptionist..!! What do you say?? Kolkata - City of Ironical Agitation..
Maharashtra - no more a part of India?